Customize your board and let\'s hit the skate parks! In this demo you start off in a skate shop where you can choose your board, grip tape style, and wheels. 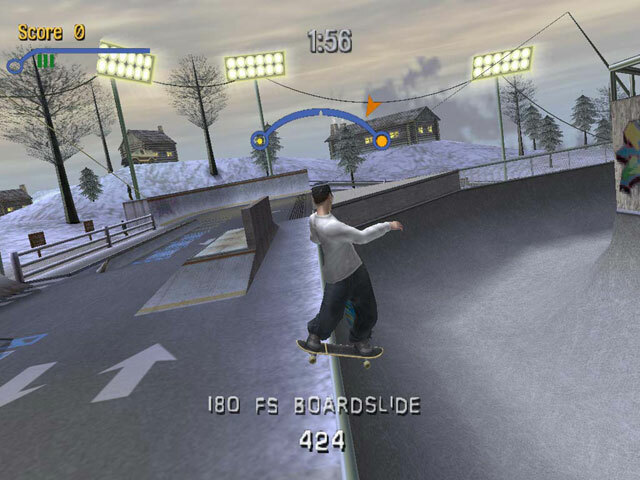 In the full game you can choose from thirteen pro skaters out there. The demo limits you to one. (Tony Hawk) There are many moves to lean and discover, not to mention many great places to do them! Be sure to do the tutorial to learn the basic maneuvers. In the demo you can do career mode where you have a bunch of objectives you need to complete in a short amount of time. Single session is timed as well but there are no goals. Free Skate allows you do what you please and for however long you want to. There is a nice tutorial for beginners. Multiplayer and online play will be available in the full game. What are the moves I will learn? What\'s in the full game? One of the biggest selling points in the multiplayer gaming. You can play up to eight friends online. Either play against them or team together. You can custom design your own skate parks. Finally there are eight real world levels to play. From a Christian perspective the music is rather intense and can be classified as grunge. Fortunately, if you don\'t like the music you can set the game to use ambient sounds instead. Also, chances are that you will fall in the game. When you do, there will be a small blood spot on the ground where you bailed. It\'s really difficult to kill your character, but you can. The most you get is a silly message (ex \'Deep Fried\' when I went into a vat of lava). Finally, there is a secret cruise ship level, where there are women everywhere wearing small bikinis. With the appropriate code to unlock all characters, and you will find that some of the unlockable characters are really bad. There are the Demoness, where you skate as a scantily clad demoness with a move called AC Air, the opposite of Christ Air, where you are making yourself in the shape of an upside down cross. Another move called Going Home, where you melt into the ground and become the likeness of a pentagram. Another character is known as Private Carrera, and she is rather...sexual. One of her moves is Ohhh Yeahhh!, where she has some moves that are provocative in nature. There is also the Neversoft Eyeball, where there is a skater that looks like Frankstein\'s Monster with a giant eyeball for a head. And then there is Ollie the Magic Bum, where you are a homeless man that is drunk. The game was easy to install and configure. When you launch the demo it has options for resolution, graphics detail, controller options and calibrating etc. The graphics looks great. Good character model detail and scenery. It ran very smoothly. The sound effects were good, and it had hard rock for back ground music. There are many moves and each have their own combo to use them. I highly recommend using a game pad or joy stick. You can use a keyboard as well. The only fluke I discovered was that even though I set the joystick as my default, I still had to set it up in the game too. (every time) The game ran stable with no lock ups. Tony Hawk Pro Skater 3 can be found on many platforms and I would recommend it for any skate boarding enthusiast.